Last night during an affordability presentation to the Austin Neighborhoods Council, I had the privilege of recognizing someone with a well deserved award. Kathie Tovo and her Policy Aide, Shannon Halley, have been more responsive and attentive to the details of affordability issues than anyone else on the Austin City Council. Not only that, Kathie’s actions have spoken louder than words. She worked with City Staff to find an alternative to spending the budget surplus for funding a worthy project for a senior citizen recreation center. And her office stayed in touch throughout the week that increasing the Over-65 and Disabled Homestead exemption came up for a vote. She steered it past an uncertain fate, all the way to a welcome victory. Giving an award is one of the fun parts of an otherwise treacherous process. 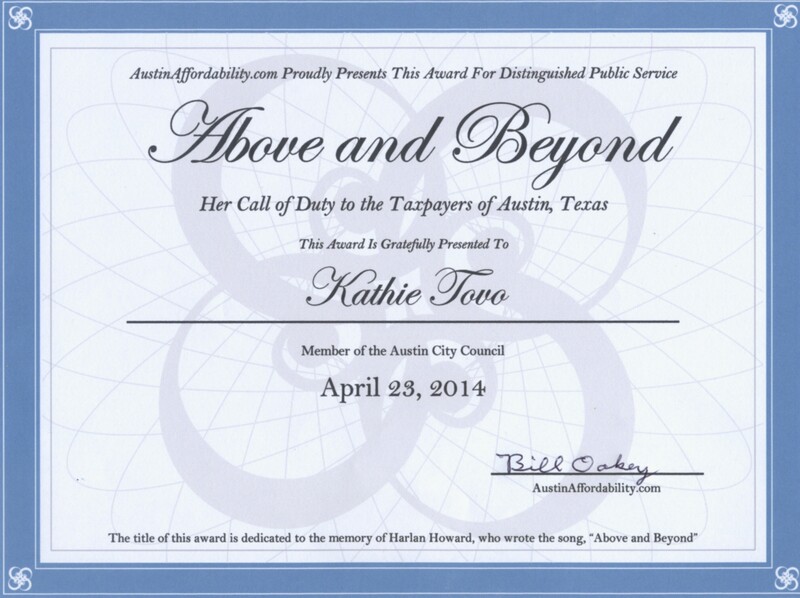 Along with it comes the AustinAffordability.com endorsement for Kathie for District 9 in the upcoming City Council election. You can see the award below. Click to enlarge it. This entry was posted in General Affordability Updates and tagged afford, affordability, Austin, Austin affordability, austin affordable, austin cost of living, cost of living on April 24, 2014 by Bill Oakey.